I have been looking for some time for new posters to add to my room walls, and move some of the existing posters / art around. 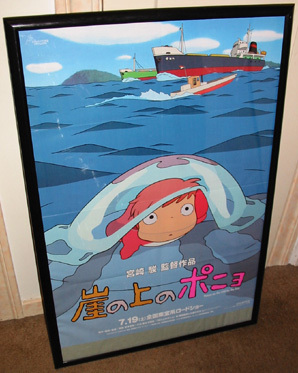 A few weeks ago I managed to get a Ponyo on the Cliff by the Sea movie poster. 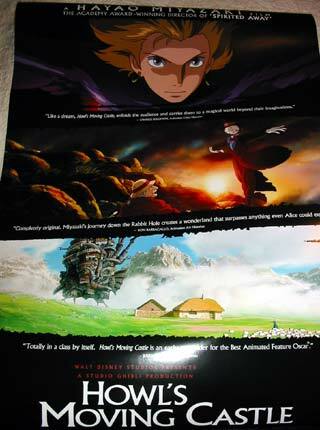 Also just a few days ago I managed to secure another addition to the collection (it arrived today), I think I got lucky on this one… an original movie poster of Howl’s Moving Castle , the challenge is now going to be to find a frame large enough to hold it, these posters are very large. Congratulations on acquiring two very beautiful posters for your room. My walls are whispering from blank spaces that I would love to fill with a Ponyo on the Cliff by the Sea poster and one from Nausicca of the Valley of the Wind. Wish me luck and thanks for sharing your treasures. Have a good day! Just in case you visit this site again, look for posters on ebay 🙂 I just saw a French movie poster of Nausicca, they also have some of Ponyo on the Cliff by the Sea. There is even one of Porco Rosso but that one is a bit expensive.